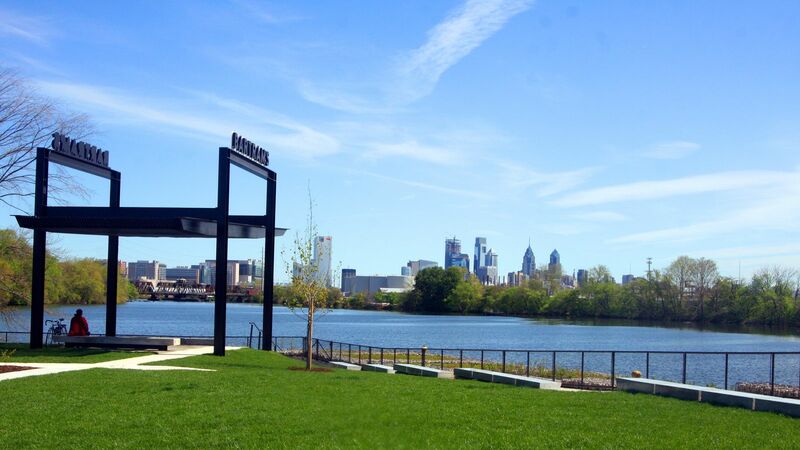 This past weekend brought the opening of the new Bartram's Mile, a 1.1-mile running, walking and biking trail along the Schuylkill River with stellar skyline views. Formerly an underutilized space along the river, Bartram's Mile is now a verdant water-facing space for bikers, walkers, runners and bird watchers that provides an appropriate connection to Bartram's Garden, a historical botanical garden and outdoor attraction located on the trail. Beautiful vantage points, simple seating, and a walk through the historic botanic Bartram's Garden are just some of the sights along the one-mile trail. Thirty-two years ago, the City of Philadelphia bombed itself. When it rebuilt the 6200 blocks of Osage and Pine, the developer hired to fix the mess used shoddy materials, and went to jail for theft of city money. In 2016, the Redevelopment Authority issued a Request for Proposals to redevelop 36 vacant city-owned homes on Osage Avenue and Pine Street, which the old contractor had so badly bungled. Last week the Redevelopment Authority announced the winning bidder is AJR Endeavors, a team of three men—Anthony Fullard, James Robertson, and Rodney Ross—who have taken on the task of healing the physical scar of the 1985 bombing of the MOVE compound. The task is herculean, the developers recognize, and not just because of the dilapidated state of the vacant rowhouses they’ll be rehabilitating. Community members made the emotional import of the project very clear at an introductory meeting organized by District Councilwoman Jannie Blackwell. Trouble in the North Liberties, Kensington ? New builds and high-end cars were targeted by an anarchist group on Monday night. Two people have been arrested so far. NBC 10 reported today that new buildings and around two dozen high-end cars near the neighborhoods of Kensington and Northern Liberties were targeted. Paint was thrown onto new townhomes, windows of both homes and cars were shattered, and security cameras were ripped off. Properties that were vandalized included homes on the 1500 block of North Second Street and the 1500 block of North Philip Street, according to the Inquirer. The anarchist group of nearly 50 protestors goes by the name of Summer of Rage. Earlier today police arrested two suspects, one from Doylestown and another from Rhawnhurst, who were allegedly involved with the protest. They were charged with causing and risking a catastrophe, criminal mischief, and related offenses, according to the Inquirer. In a rapidly changing neighborhood, a one-story architectural frame rises, serving as a symbol of gentrification and social justice. Top: Artist Tieshka K. Smith’s gallery at the temporary art installation includes scenes of gentrification in Kensington. Forty Units For Triple Property Near Temple? We were scanning the zoning calendar today and noticed a plan for three properties at the corner of Carlisle & Jefferson, two of which are currently sitting vacant. According to public record, Templetown Properties owns the building at 1603 Jefferson St. while the City owns the two empty lots next door. Thanks to a VPRC resolution from last month though, we see that the City has sold off the vacant lots to this developer. The aforementioned zoning calendar suggests a plan to demolish the building and construct a new project on the combined 5,000 sqft parcel. The project calls for a new building with 40 apartments, even though the code allows a mere 13 units by right. We aren't sure how tall of building would be required to get to that unit count, but we'd think it would need to rise at least five stories. This would trigger a height refusal as well as a density refusal, and if we're thinking about it there might end up being an open area refusal as well. 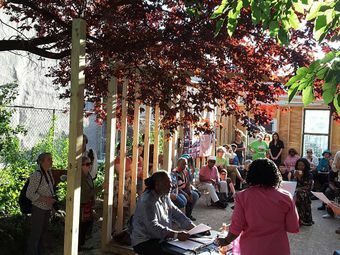 The Brewerytown Garden, located at the corner of 27th & Master, is one of the more successful community garden spaces we can think of, offhand. The garden was initially established like half a dozen years ago as Marathon Garden, a farm to table operation associated with Marathon Grill. By 2015, Marathon was out and the community stepped in and rechristened the space for the neighborhood. The garden is about half an acre in size, contains 75 individual plots, and has electricity, running water, composting bins, and a community gathering space. The improving Girard Avenue corridor makes Brewerytown a more livable neighborhood, but this garden helps maintain the feeling of community in the area. It's been a little while since we last checked in on the 3000 block of W. Stiles Street, as our last visit came over three years ago when we told you about a quartet of homes that were getting renovated. Like many others in Brewerytown, this block has been trending up in recent years, swapping blight for renovation. Despite this, a vacant lot has remained intact at 3018-22 W. Stiles St., seemingly ripe for new construction. It turns out, it's a little more complicated than it looks at first glance. The lots on Stiles Street are actually the overgrown rear yard of a six-unit building on Girard Avenue. In order for new homes to rise on Stiles Street, the owner of the property needs to subdivide it, a move that will require the approval of the ZBA. That's why representatives of the developer presented plans for three homes on Stiles Street to the Brewerytown-Sharswood Community Civic Association last week. The project got community support, which gives us a sense that the ZBA will likewise grant their blessing. The Philadelphia Housing Authority (PHA) broke ground yesterday on its planned $45 million new headquarters at 2013 Ridge Avenue. The multi-phase project, known to some as Sharswood-Blumberg, will first bring a six-story building to the site that will be the new home of the PHA. Later phases will include mixed-use buildings, retail, and residential units to the triangular site, as well. The groundbreaking comes after a somewhat rocky response from the design community last year. The PHA presented its design proposal for the six-story building twice to the Civic Design Review. The committee hoped for a design that was less suburban, and commented on the lack of communication between the two city agencies. PHA says the hope is that its new headquarters will be an economic driver for the revitalization of Sharswood. The North Philly neighborhood is currently in the middle of a $500 million redevelopment transformation that aims to bring 1,200 residential units and a retail corridor along Ridge Avenue to the area. In addition, PHA recently acquired the local Vaux High School, which is set to re-open this year. In 2016, the number of construction permits pulled for the Callowhill neighborhood doubled year over year. The number of property sales nearly tripled between 2010 and 2015. All the while, Callowhill’s population boomed as more young working professionals moved into the neighborhood. It doesn’t take more than a quick walk around the neighborhood to come to the conclusion that Callowhill is on the rise. That’s the consensus of a new report by FixList and research analytics firm JLL, which deemed Callowhill, a once troubled neighborhood that served as inspiration for David Lynch’s film Eraserhead, as a fast-emerging market with plenty of room to grow, even with its already rapid transformation. 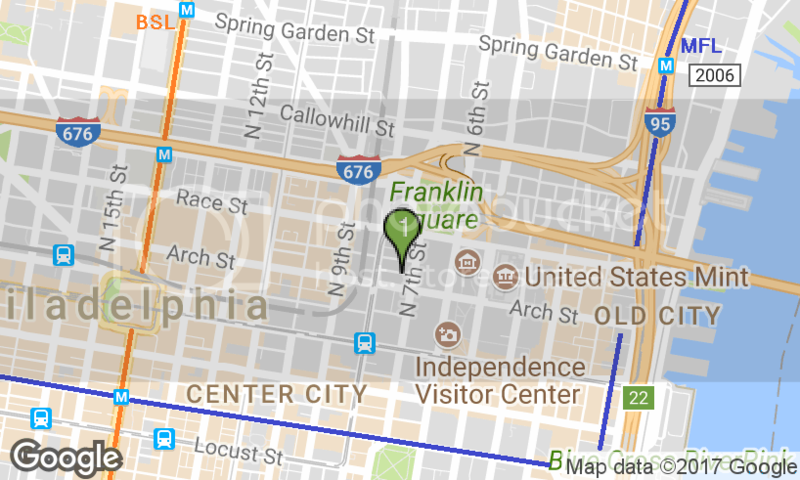 For all intents and purposes, Greater Callowhill is defined as the area between Vine, Spring Garden, North Broad, and North 2nd streets. Between 2010 and 2015, the number of properties that sold increased by nearly three-fold, from 150 to 440 properties, and many of them are zoned for high-density use. This is in response to the area’s new zoning overlay, which allows for more high-density construction in what has been typically an industrial-zoned neighborhood. Although property sales have tripled and issued construction permits have doubled year over year, the report found that there is still 400,000 square feet of undeveloped land in the Greater Callowhill area. These findings are no surprise to developer Craig Grossman, whose company Arts and Crafts Holdings has been buying up Callowhill properties and restoring them since 2015. At last count, Grossman says his team has acquired a dozen properties up and down 10th Street, a collection referred to as the Spring Arts District. There’s also the fact that as Center City’s leasing rates climb higher, tenants find Callowhill’s comparatively affordable rates much more reasonable. The average price per square foot here is $21. The highest office rents in Center City are about $31 per square foot, according to Center City District’s latest report. Callowhill’s growth is far from over, the FixList/JLL report concluded: “We anticipate continued, ongoing interest in both residential and office development in this fast-emerging neighborhood,” the researchers wrote. At the time, Northern Liberties to the east was already booming, he continued. 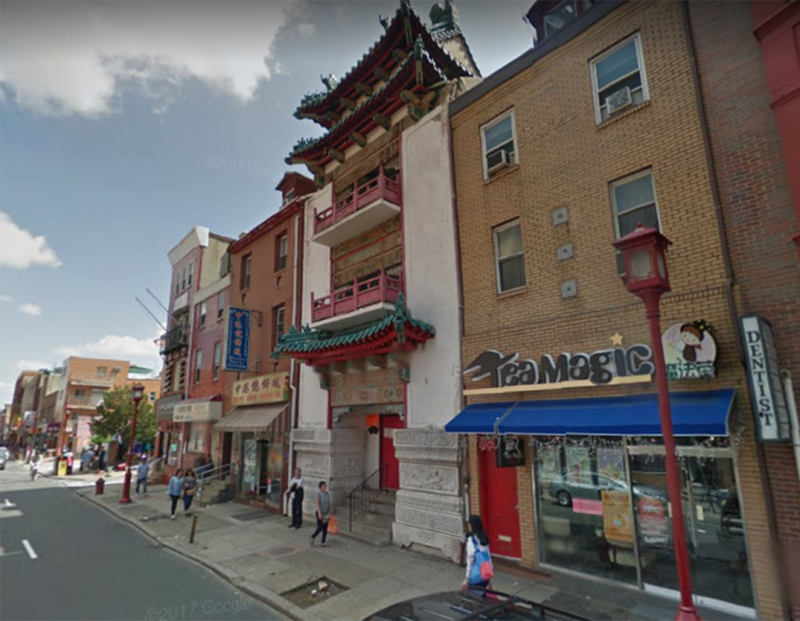 Chinatown was expanding North, North Broad’s renaissance was underway, and the redevelopment of the Rail Park, which cuts right through Callowhill, was imminent. The boom of Callowhill is especially apparent in its changing demographics. The FixList/JLL report notes that the neighborhood’s total population skyrocketed between 2010 and 2014 by 30 percent—that’s 10 times faster than Philly’s population growth as a whole. Furthermore, millennials and young working professionals make up a good chunk of that growth. A number of big-time tenants are planning to set up shop in the Greater Callowhill area, including Target and Yards Brewery at 6th and Spring Garden. Meanwhile, an entire neighborhood within a neighborhood, marketed as Callow East, holds plenty of potential for development, too. Planning Commission officials spent the summer working out the details of a new zoning overlay for East Callowhill, in hopes of transforming the narrow area separating Old City and Northern Liberties from an industrial desert into a walkable neighborhood with new apartments and commercial projects. The legislation, which was recommended by the Commission on Tuesday, rezones the area bounded by 2nd, 6th, Spring Garden and Callowhill streets—31 parcels in all—to CMX-3, a medium-density commercial category that matches the zoning of the Central Delaware. The area is currently zoned I-2 for industrial development. Under the terms of the bill, projects on the north side of the overlay would have a base height limit of 65 feet, but could climb as high as 144 feet if developers claim any of a variety of bonuses for things like stormwater management, open space, through-block connections, and mixed-income housing. Projects on the south side of the overlay, facing Interstate 76, would be limited to 100 feet, but could rise to 340 feet with bonuses. Councilman Mark Squilla introduced a preliminary version of the overlay in June. Squilla said at the time that the bill was intended to bring more density to the area. Don’t call it Pier 9: A long-abandoned pier on the Delaware River Waterfront is set to undergo a major $4 million makeover. It’s new name? Cherry Street Pier. The Delaware River Waterfront Corporation (DRWC) announced yesterday that with a $683,000 grant from the Knight Foundation, it will renovate and re-open Pier 9 as a creative community space space, complete with an open-air garden, food vendors, pop-up retail markets, and shipping containers-turned-offices. Under the new name Cherry Street Pier, the 93-year old warehouse will be renovated and restored under the design leadership of Interface Studio Architects (ISA) and Groundswell, the same firm behind the massively popular Spruce Street Harbor Park and Delaware RiverRink Summer and Winter fests, both located on the river. The news comes at a key turning point for the Delaware River waterfront. 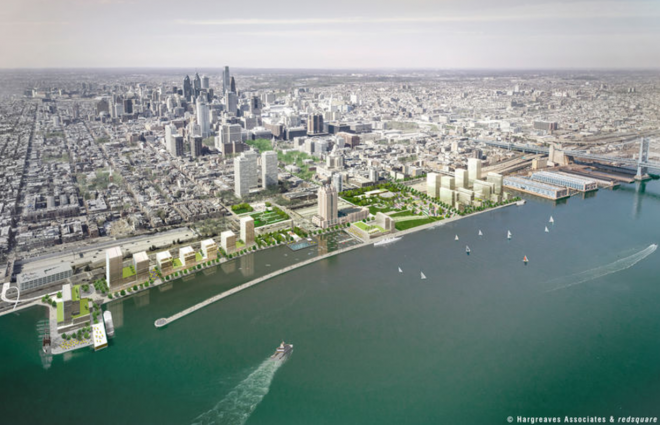 Earlier this month the DRWC also announced that the $225 million Penn’s Landing/I-95 capping project would be moving forward, with the last remaining $10 million committed by the City of Philadelphia, the State of Pennsylvania, and the William Penn Foundation. That massive undertaking is still years away, so Cherry Street Pier will be DWRC’s next project to come to fruition. The pier has sat vacant for decades, although last year it served as the backdrop for fabric artist Ann Hamilton’s ethereal “Habitus” exhibit. It was the first time the pier had been open to the public in years. “Cherry Street Pier is the latest example of the vision of the Master Plan coming to fruition, and will contribute to the ongoing resurgence of the Delaware River Waterfront,” said DWRC’s in-coming president Joe Forkin in a statement. Here’s a more detailed breakdown of what to expect at Cherry Street Pier, when it opens it late spring or summer of next year. At the entrance of Cherry Street Pier will be a section called the Garage, which will be home to 14 shipping containers stacked on top of one another. These big boxes, ranging from 160 to 480 square feet, will serve as office space for creative entrepreneurs who can sign on for flexible leases. Also available for lease will be spaces for vendors to set up shop and sell their own goods. Like the offices, leases will be flexible: Market place vendors will be able to rent a space just for the afternoon, multiple days, or longer. The middle of the pier will be reserved for the Platform, a big space that will be dedicated to art installations, performances, and other public events. The end of the pier will undoubtedly offer some pretty breathtaking views of the river. The plan is to remove the roofing in this section in order to expose the pier’s trestles and open sky. Dubbed the Garden, this area will be sectioned off from the rest of the space via a glass wall and feature seating, tables, and some foliage. (Hmm. So may black couples, and single fathers - and not one white couple? Looks like one old Jewish couple, maybe. "seemingly impossible projects are now underway"
No, I meant it: persistence is catching up to vision in 2017 Philadelphia. Long-imagined and seemingly impossible projects are underway, from the construction of the Viaduct Rail Park to the restoration of the Metropolitan Opera House. And now, Penn’s Landing. 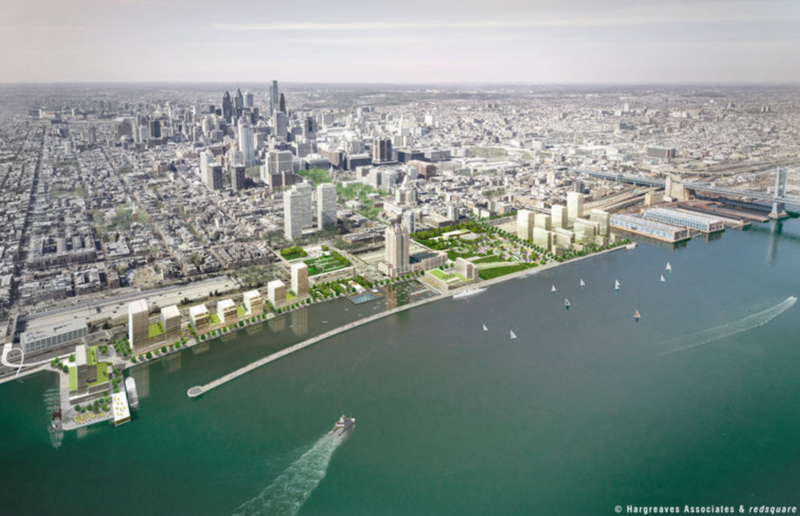 On Friday, Pennsylvania Governor Tom Wolf, Philadelphia Mayor Jim Kenney, and Janet Haas, the board chair of the William Penn Foundation, along with officials of the Delaware River Waterfront Corporation, announced that all but $10 million in funding had been committed for a $225 million plan to reconnect the central waterfront at Penn’s Landing to the street grid of Old City and Society Hill. 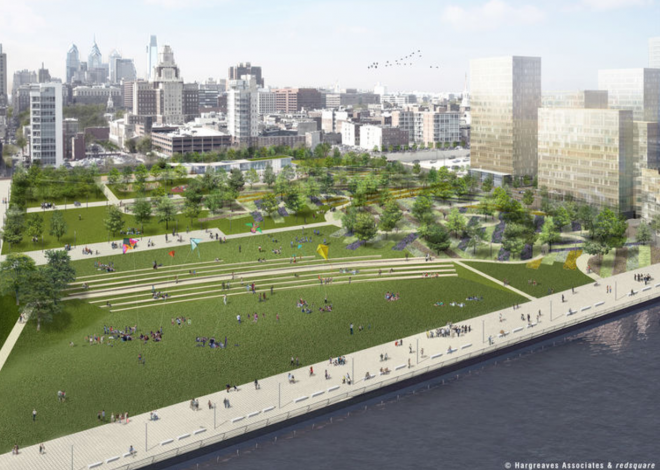 While the plan falls short of the dream of removing I-95 from the center of Philadelphia, it effectively gives the city an eight-block-long central linear park that will extend from 6th Street to the Delaware River. 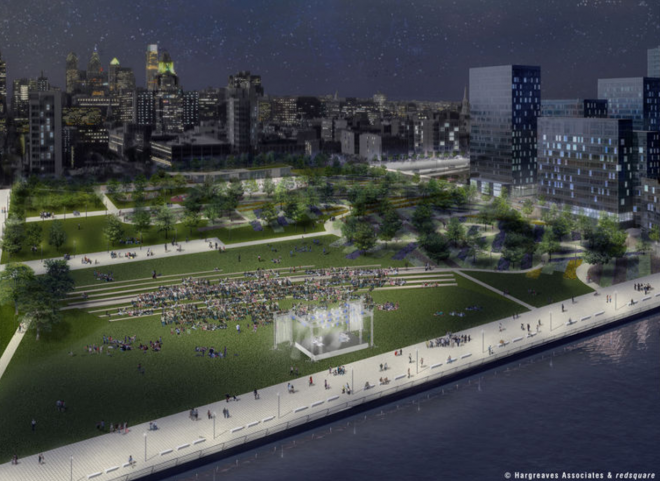 And it explicitly sets aside the block between Chestnut and Market Streets along the waterfront for a high density neighborhood the new Penn’s Landing park will need to be successful. Advocates of the project estimate, conservatively, an additional $1.6 billion in tax revenue from the private real estate development that should follow the $225 million public investment. Construction seems likely to begin in 2020. The project will include an extension of the South Street pedestrian bridge over Columbus Boulevard; a two-mile long protected bicycle path; and reconstruction of the Delaware River tidal basin and marina at Spruce Street, now the home of the popular Spruce Street Harbor Park. But the heart of the plan is a four-acre cap over I-95 and Columbus Boulevard between Walnut and Chestnut Streets that will include gardens, a cafe, a spray park/ice skating rink, and the Irish famine and Scottish immigration memorial sculptures and total replacement of the eight-acre, stone terrace Penn’s Landing with a wide waterfront lawn. Hargreaves Associates, a landscape architecture firm, which completed similar projects in Louisville, Chattanooga, and San Diego, has furnished the deceptively simple design. The cap over I-95 and Columbus Boulevard is the key connector between the city and the riverfront. Much has been said over the years about the necessity of this single intervention that will, at least in this one critical spot, stitch the city back to its origin and its historic life-blood, the Delaware River. But I’m equally hopeful that the new park will invigorate and realign (in the urban imagination at least) the experience of Independence National Historical Park. Beyond the long-ago closed path through the arches of Independence Hall, the INHP has never quite fit into the daily rhythms of Philadelphians. Because of that, most of the small gardens and pastoral lawns are empty despite a substantial increase in tourists to the park’s major historical sites and the landscape in key areas is poorly maintained (the jewel of American heritage is obscured by tall weeds). The new Penn’s Landing may correct even this Philadelphia white elephant, but particularly if planners and INHP officials collaborate. With improved crossings at 5th, 4th, 3rd, and 2nd Streets, the everyday Philadelphians might discover the delight of a central park, much of which has been sitting there awaiting them for more than fifty years. This historic building at 1600 Callowhill St. has probably caught your eye at some point, somewhere along the line, even if you've never set foot inside. The handsome structure was built at the beginning of the 20th century and was once home to the Middishade Clothing Factory. It was added to the National Historic Register and the local register in the 1980s, at the same time it was converted into office space. Currently, it's best known for the U.S. Citizenship and Immigration Services office for the region. But perhaps not for long. Developers purchased the building at the end of last year, paying an impressive $11M. According to the zoning application posted to the building, they're intending to radically change the use of the structure. The developers are looking to convert the building into 93 apartments with 36 parking spaces, and a retail space on the first floor. This seems like a very reasonable change to us, and with the CMX-4 zoning it's not much of an ask. Westrum Development Company was way ahead of the curve in Brewerytown, building an entire square block of homes on the 3100 blocks of Thompson and Master Streets over a decade ago, seemingly planning for a neighborhood on the rise. Change didn't come as quickly as expected, and the economic downturn of 2008 didn't help, so Westrum's plans for additional development was put on hold, indefinitely. 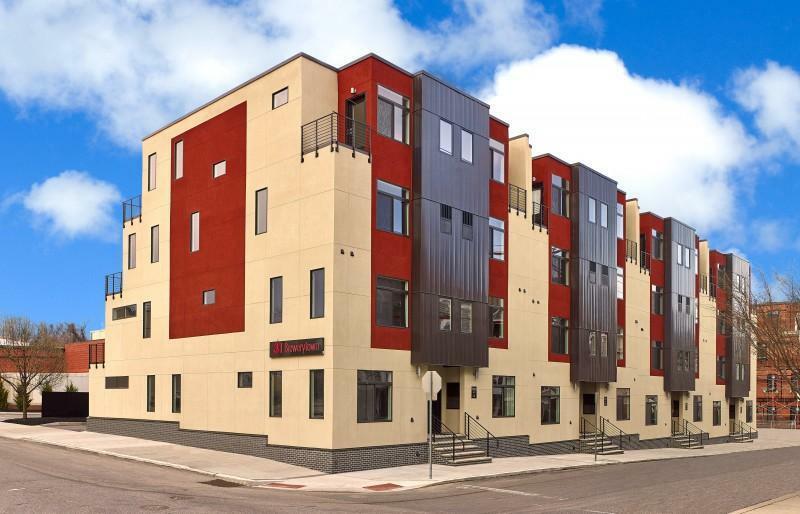 It wasn't until 2014 that Westrum started up again in the neighborhood, building 31 Brewerytown, a pair of large rental apartment buildings on the south sides of the 3000 and 3100 blocks of Thompson Street. 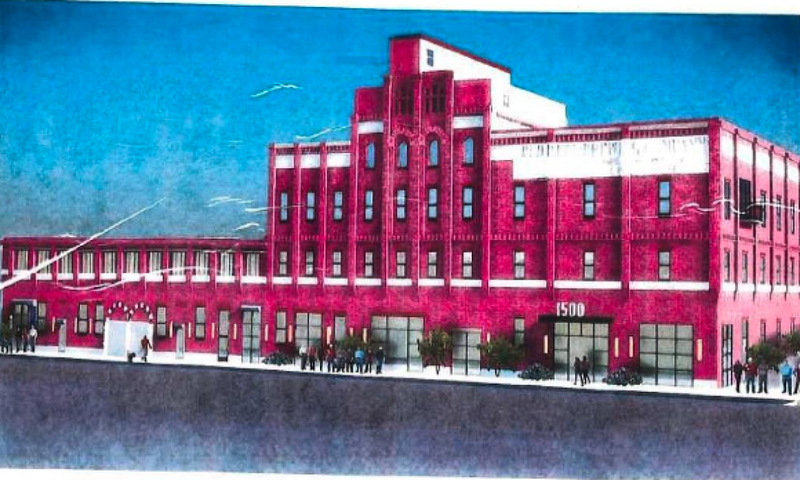 Earlier this year, we told you about a plan for 200 more units from Westrum on the large vacant lot to the south of the Red Bell Brewery, though that project hasn't gotten started yet. The Brewerytown boom continues, with 26th Street now getting in on the act. 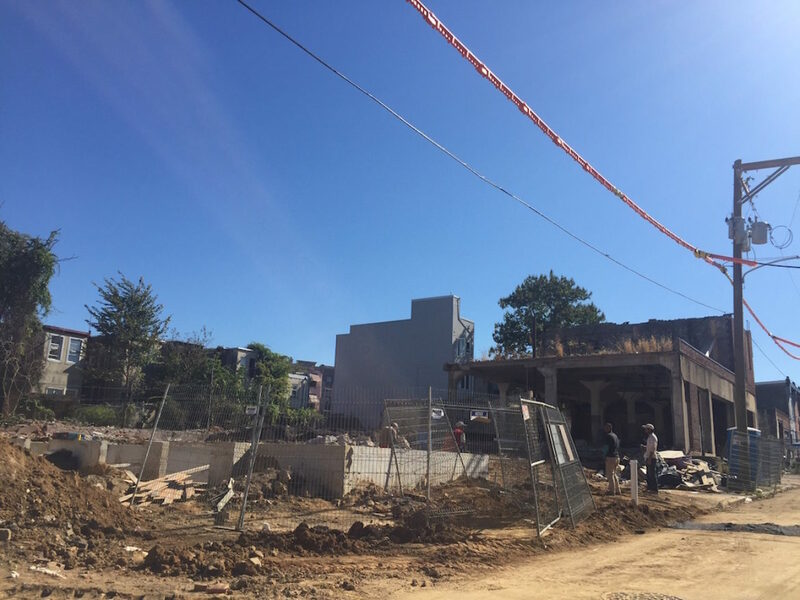 A reader tipped us off about some zoning notices posted at 1214 N. 26th St., a large property that's hit a bit of a rough patch in recent memory. If we turn back the clock just a few years, this property was home to a two story warehouse on its southern side and a one story former industrial building on its northern side, with a vacant space in between. We won't claim that the property was the Garden of Eden or anything, but it was a step up from the present. The two story building collapsed somewhere along the line, and has been hastily repaired. And the one story building is gone. Will New Homes Plant a Brewerytown Flag in Strawberry Mansion? Developers completed a renovation of the Eastern building last year, and it's been a revelation. Previously, this building, located at the intersection of 30th Street, Cecil B. Moore Avenue, and Glenwood Avenue, was sitting vacant and looking awful for many years. Thankfully, developers were able to preserve the building's bones and create 37 apartments, office space, and a day care. It definitely catches the eye as you pass by, and it has definitely extended the market rate footprint of Brewerytown up to Cecil B. Moore Avenue. Speaking of the extension of the market rate footprint of Brewerytown, now we think there's some collateral "damage," thanks to the Eastern building's renovation. A reader reached out to us to tip us off to some zoning notices a block to the west, beyond the sunken rail tracks, on a parcel that's been sitting vacant and overgrown for who knows how long. 3118 Cecil B. Moore Ave. is a large parcel, with about 12K sqft of space, and according to the Stormwater Map it's now owned by Fin Development. 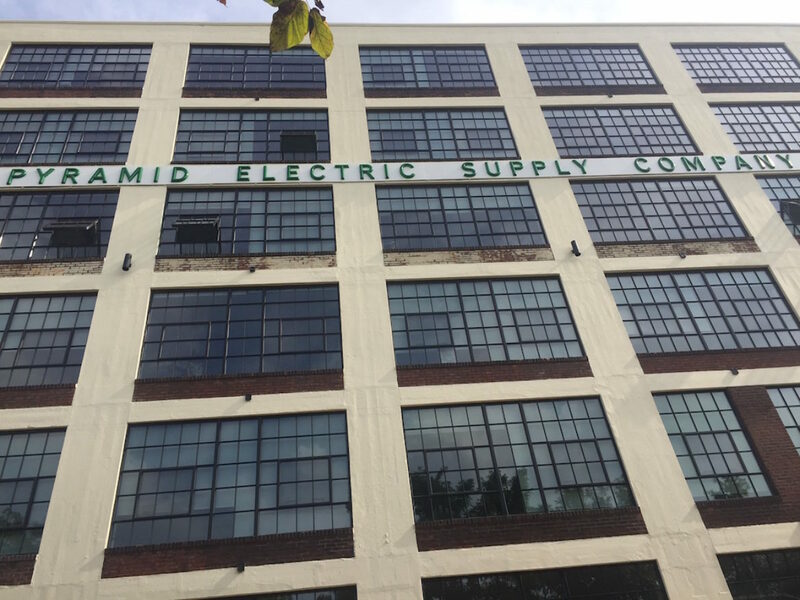 Local developer Arts & Crafts Holdings has snatched up another property in the greater Callowhill neighborhood, continuing its mission to redevelop the neighborhood into a place for the creative economy.